Sidney’s Sara Gibson plays a No. 1 doubles match against Northmont on Wednesday in Sidney. Gibson’s partner was Jenna Allen. 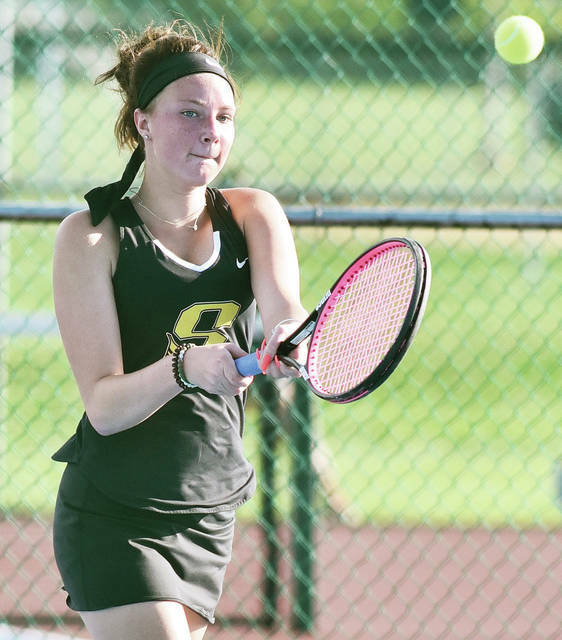 Sidney's Mara Hecht returns the ball against Northmont's Ali Ullery during a #3 singles match at Sidney Wednesday. Sidney's Jenna Allen plays a #1 doubles match against Northmont at Sidney Wednesday. Sidney's Sara Gibson was her partner. Playing for Northmont were Hailey Jenkins and Athaiah Peters. Sidney’s Hailey New returns the ball against Northmont’s Aubrey Ferrell during a No. 1 singles match on Wednesday in Sidney. New won a marathon match to give Sidney a 3-2 win. 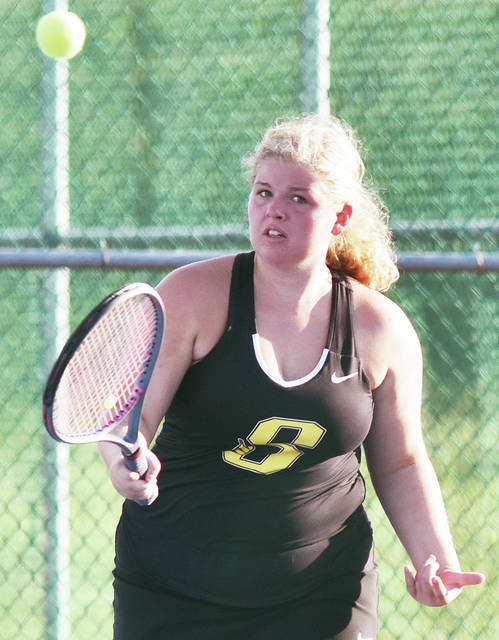 SIDNEY — Sidney’s Hailey New won a marathon match at first singles to lift the Yellow Jackets to a 3-2 win over Northmont on Wednesday in Sidney. After lightning caused the start of the match to be delayed, New’s match took three sets to decide. She won 6-2, 6-6 (8-10 tiebreaker), 7-6. Kara Mays won at second singles 6-0, 6-0 and Mara Hecht won 6-0, 6-2 at third singles. Sara Gibson and Jenna Allen lost 6-4, 6-3 at first doubles. Ireland Ike and Alyssa Chavez lost 6-1, 6-3 at second doubles. The win improved Sidney’s record to 5-3 overall. The Yellow Jackets are 3-0 in GWOC American North Division play. Lehman Catholic lost a road nonconference match on Wednesday to the Green Wave, which improved to 7-2. In singles, Claire Larger lost 6-1, 6-0. Sarah Gibson lost 6-0, 6-1 at second singles and Angela Brunner lost 6-0, 6-0 at third singles. In doubles, Ann Pannapara and Keira Burns lost 6-1, 6-0 and Shannon Staley and Brieanna Werling lost 7-5, 6-2. The Cavaliers earned a Northwest Central Conference win on Wednesday. Cole Gilardi led all golfers with a 40 while Mikey Rossman had 42, Brandyn Sever had 52 and Alex Keller had 53. Sidney improved to 5-0-0 overall with the win and 3-0-0 in Greater Western Ohio Conference American North Division play. Lehman picked up an NWCC win on Tuesday. Cole Gilardi led the Cavaliers with 41. Mikey Rossman shot 43, Alex Keller shot 43 and Brandyn Sever shot 58. 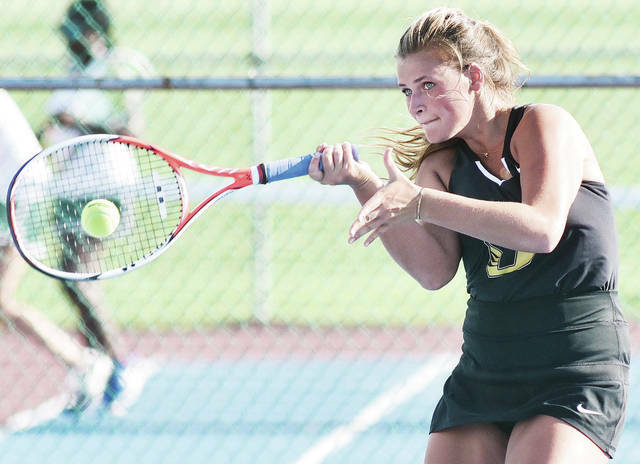 Sidney’s Mara Hecht returns the ball against Northmont’s Ali Ullery during a #3 singles match at Sidney Wednesday. 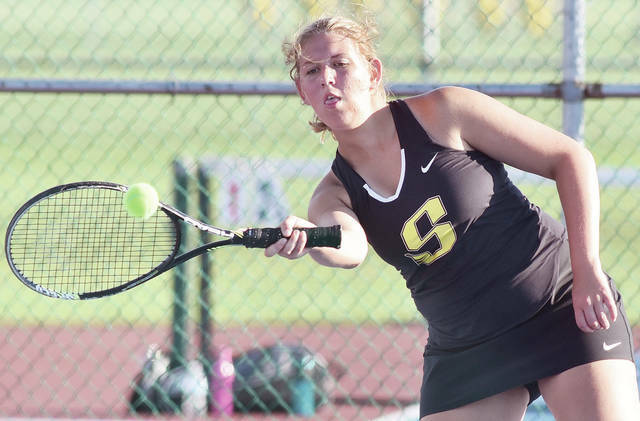 Sidney’s Jenna Allen plays a #1 doubles match against Northmont at Sidney Wednesday. Sidney’s Sara Gibson was her partner. Playing for Northmont were Hailey Jenkins and Athaiah Peters.